Wildfires continue to burn across the country, with flames racing through Washington State for the fifth day and two small communities in Idaho bracing for the worst. NBC's Kristen Dahlgren reports. Crews in central Washington, rural Idaho and Southern California made gains on several wildfires, allowing some evacuees to return home and protecting two vacation towns from a massive encroaching blaze. Firefighters stopped a fire about 75 miles east of Seattle from destroying more buildings in the past two days, fire spokesman Mark Grassel said Thursday, The Associated Press reported. The blaze near the town of Cle Elum burned at least 70 homes, more than 200 outbuildings and about 35 square miles of wildland since it started Monday. Some people were able to return home, only to find nothing left except the land their home sat on. The Letson family discovered the only thing left standing upright was a satellite dish. “I’m thankful we weren’t in it,” Virginia Letson told NBC station King 5. They lost everything except what they shoved into two small suitcases as they escaped the fire. “We did not have insurance, so that was not a good thing,” Letson added. Mary Colley-Shults went through her family heirlooms. She said she’ll miss her grandmother’s dishes the most. But Colley-Shults still has her home, and her horses and cats survived. Even though she can’t replace what she lost, she still has the memories they created. Crews focused on strengthening lines on the fire's stubborn north flank, where flames whipped through thick pine and fir forests in a steep, rugged area. In the Pacific Northwest, property owners got a first look at what's left of their property after the Taylor Bridge fire tore through their region. Â NBC's Kristen Dahlgren reports from Washington state. "They're really trying to button up that line so they feel more secure about it holding," Grassel told the AP. Firefighters' work allowed officials to lift some evacuation orders, although homeowners said they didn't feel out of danger yet. Unusually hot, dry, unstable weather was expected Friday and Saturday, with thunderstorms possible, Grassel said. Laurie Plut said the fire has hovered right at the timber line, just beyond the wood cabin she and her husband have been building over the past 12 years. "We're still worried. It's extremely frustrating, but the firefighters have been working hard," she told The AP by telephone. "And we have to love them." 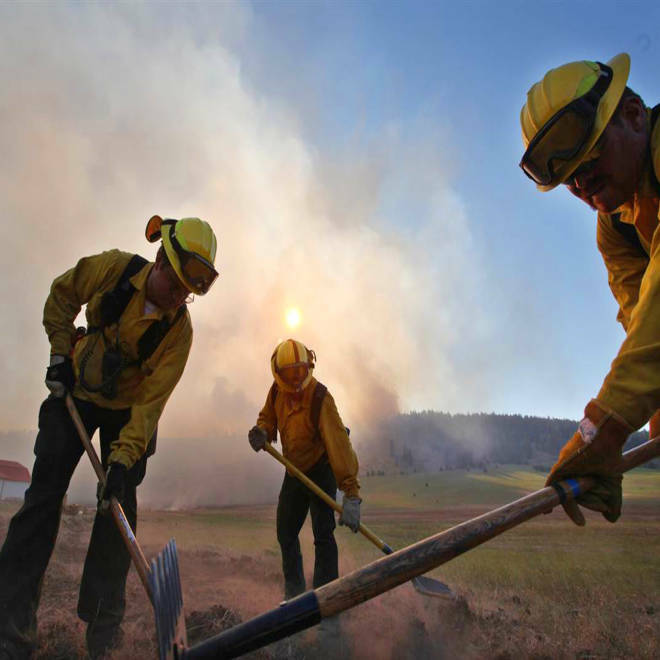 In Idaho, crews at 12 big fires worked to protect homes and build lines. Teams of firefighters arrived in Featherville to prepare for work against a huge wildfire that has been advancing on the small communities of Pine and Featherville. Strangely enough, a column of smoke from the blaze settled over Featherville on Wednesday, cooling temperatures and slowing the fire's steady march toward town, fire information officer Lisa Machnik told Reuters. That gave residents time to protect homes and cabins and prepare for a possible evacuation. The blaze started two weeks ago in the Boise National Forest and has scorched more than 108 square miles. NBC station KTVB reported that the Custer County Sheriff’s office had urged people who live in an area including Custer Town and Jordan Creek to get out as a nearby wildfire worsened. The sheriff’s office said the 2,000 homes affected should be evacuated by 5 p.m. Friday local time (7 p.m. ET). In the eastern part Idaho, a group of fires that burned more than 114 square miles finally slowed after it blazed through stands of timber killed by bark beetles. The fires were moving northeast, within three miles of the Montana border. Idaho Gov. C.L. "Butch" Otter has issued a disaster declaration, clearing the way for the Idaho National Guard to get involved. Thousands of firefighters were battling blazes throughout the West, which has been hit by hot, dry windy conditions in a fire season that officials said started early. Fire managers and state officials kept a nervous eye on forecasts that warned of more hot, dry weather with possible thunderstorms in many areas. The ominous weather forecasts were cited by Oregon Gov. John Kitzhaber, who on Thursday declared a statewide state of emergency that authorizes use of National Guard helicopters to fight wildland blazes. He noted that much of his state was in extreme fire danger, the imminent threat of wildfire and mentioned a 123-square-mile blaze in southern Oregon. Higher humidity helped at a huge wildfire burning on both sides of the Nevada-Oregon state line. The lightning-sparked blaze has burned 722 square miles of sagebrush.